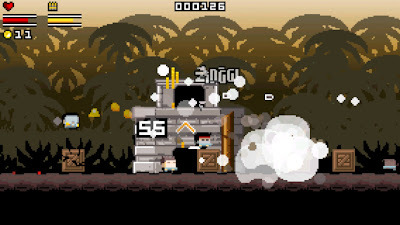 Gunslugs is a run 'n' gun title that is decidedly retro in its approach and the concept will be instantly familiar to anyone who has played, well, pretty much any action arcade game from the 1980s and early 1990s. 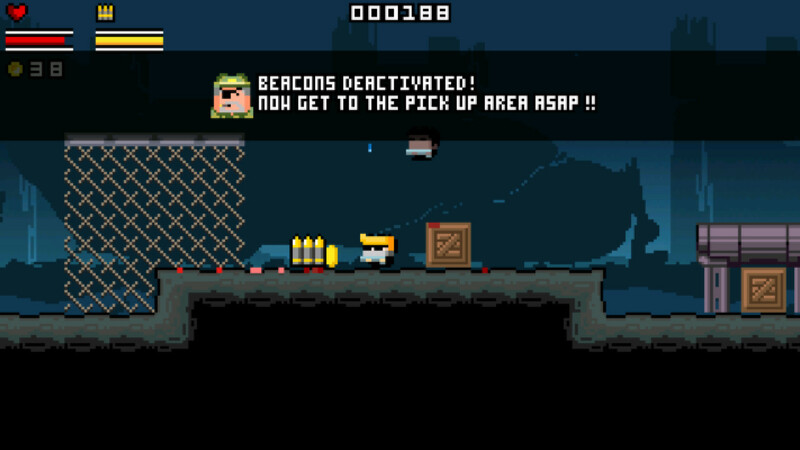 Advance your gun-toting hero onwards to the right, blasting anything and everything that stands in your way. Rinse and repeat. Our friends at Wide Pixel Games recently paid similar homage to the 80s arcade era with their Ouya release, Heavy Recoil. 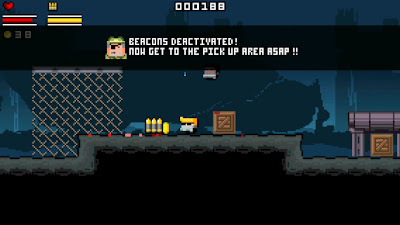 However, where Heavy Recoil focused on delivering a genuinely authentic vintage arcade experience, Orange Pixel have instead opted to infuse Gunslugs with a modern twist; random level generation. After all, this is 'retro' gaming as viewed in 2013, not 1986. In contrast to the dithered and anti-aliased pixel art wizardry of yester-year, Gunslugs' chunky art style may at first grate with action fans used to seeing more realistic or traditionally rendered characters. It certainly takes a bit of getting used to, and there are times when the clash of bold-outlined characters makes it difficult to tell what's going on. However, once you actually start to play the game the fast-paced action quickly overrides any concerns about the graphics. The cluttered and overlapping sprites merely adds to the impression of carnage and mayhem on the battlefield, and after a short while you'll be unable to imagine the game in any other style. 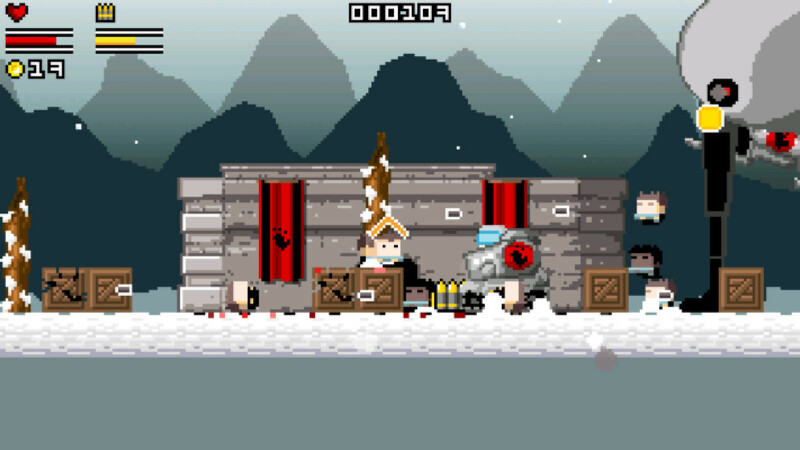 Gunslugs sees you take your hero/heroes on a series of military 'tours', with classic locations like the faux-Vietnam jungle or Siberian-style snowy wastelands. Each level is split into three stages including a boss fight to finish off with and completed tours are recorded against each character in the character selection screen. It's a nice touch, as is the underlying theme of you rescuing 1980s action heroes, who then become playable characters themselves. Although the early stages are relatively easy, the difficulty curve is steep thereafter. However, it never feels unfair and it is always great fun charging into the midst of your enemies with a flamethrower in hand. 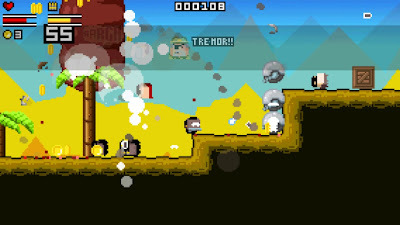 In fact, the way the game almost seems to encourage this behaviour is one of the reasons you may find yourself dying frequently if you lack the patience to hang back and try take out your enemies from a distance. This is doubly so in co-operative mode. While the game is easier with a comrade sat on the couch beside you, it also provides a false sense of security and the challenge not to charge into the midst of battle at every opportunity remains. The on-screen chaos means that you'll often unwittingly run over a mine, or, as my friend did, shoot an exploding barrel just as I was flying over it whilst sporting a nifty jetpack. As an aside, the brief slow motion segments that occur after a big crash or death are fantastic. One of the other pleasures of the game is discovering the myriad of different weapons and gadgets, from the aforementioned jetpacks and flamethrowers, to chicken guns and weaponised vehicular contraptions. The game never feels in danger of becoming stale, but the constant churn of new weapons to enjoy reinforces its freshness. Likewise the discovery of buildings you can enter as you progress through each level provides moments of respite, levity and occasionally surrealism. Sometimes these rooms are simply ways of providing you with extra ammo or coins. Others contain jukeboxes that allow you to switch between all the different (and amazing) chiptunes that comprise the soundtrack. And on some occasions they contain bonus levels that whisk you away to bizarre themed worlds and continue the action before taking you back to the main game once you die. There's no repetitiveness to repeat plays of Gunslugs either, due to the randomly generated levels ensuring that no game plays the same twice. This also has the additional effect of increasing the challenge on each level, as it is impossible to memorise the waves of enemies or positioning of platforms. Even before you take into account the absurdly good value price tag of $1.99, Gunslugs is easily one of the most polished games on the OUYA platform. Much like Canabalt HD, playing with a real controller and together with a friend via local multiplayer takes it a cut above its siblings on touch-screen based platforms. The attention to detail and desire to go above what is necessary to create a slick arcade shooter really marks this game out amongst its peers. The fact that games half as good sell for twice as much only makes this purchase all the more essential. Download the demo/purchase the iOS version here (from the iOS App Store). Download the demo/purchase the Android version here (from Google Play). Download the demo of the Ouya version here (from Total Ouya).